As for the Hunter’s Moon – a beautiful full moon named for illuminating hunters’ prey — cloudy skies and light snow showers prevented us from seeing it in the Inland Northwest. However, we did witness our first snowfall, along with early evening darkness after setting our clocks back. After intermittent accumulations Friday night and Saturday, parts of the region awoke Sunday to a winter storm unloading several inches of snow. All said, 6.9 inches fell at Spokane International Airport throughout the weekend, with 3.2 inches on Sunday. That’s the most snow ever recorded for Nov. 5, breaking the previous record of 1.9 inches in 2013. About 30 miles north, the tiny town of Elk got a total of 6 inches, while 2 inches fell in Pullman but mostly melted before it could accumulate. 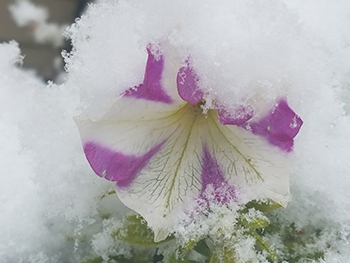 Flower caught in first snow. Did the white stuff fly earlier than usual this year? Yes. The average date for measurable snowfall in this area is mid-November. With last year’s landing date of Nov. 16, the first snow of 2016 couldn’t have been more punctual. Which leads to a big question: Is the Pacific Northwest poised for another cold, snowy winter? After all, still fresh on our minds are the 61.5 inches of snow that fell on Spokane last winter, the waves of subzero temperatures and the 14 days of freezing rain and drizzle. It’s too soon to know if we’ll have a repeat season, but the recent blitzing of winter-like storms is consistent with the presence of a La Nina that’s developing in the tropical Pacific Ocean. La Nina typically causes cooler, wetter winters in the Pacific Northwest, and last winter was no exception. Even so, other climactic forces play a role in determining our winter weather, such as variable weather fronts and shifts in high-altitude rivers of air known as the jet stream. But being that La Nina is a strong driver, you can bet that scientists are keeping a close eye on how much the ocean temperatures continue to cool in the Pacific near the equator. If this continues to build, we will embark upon the second La Nina winter in a row. A fitting, nontechnical translation for La Nina? Time to ski and get snow tires.